Worried about such a small issue of dark underarms,In the climate of summer, girls like to wear light and sleeveless clothes, but underarm arm darkness stop them from doing so many times.Even after spending so much money in beauty parlour, the problem can not be solved.To make the dark underarm into a glowing,clean underarm does not require much or special effort, just a little bit of information and some remedies.So here we share some effective remedies for clean darken underarms. 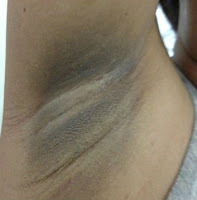 Remove Dead Skin - The underarm looks more black due to the layer of dead skin. For this, clean up the underarm with Deep Cleanser and scrub.For scrubbing,use fruits enzyme powder (skin peeling powder). It makes the skin smooth, clean and shiny. Use Potato - Potato is a natural bleaching agent for lighten dark underarms colour.Cut potato slices and massage it for 5 minutes twice a day and make the underarm clean. Lemon - Massage the underarm with lemon slice for 10 to 15 minutes and then wash it with cold water. Continue doing it for 2-3 days continuously for clean and beautiful underarms. Baking Soda - Massage the underarm from baking soda and water paste. This leads to lightening the underarm's darkness and the skin starts to shine.Use rose water with baking soda for better results. Sandalwood With RoseWater - Mix sandalwood powder with rose water.Apply this paste on effective area. Rose water will cool the skin and sandalwood make your skin light and fair.You can use this remedy daily for better results. Gram Flour - Make a paste by mixing gram flour, curd and lemon juice. Apply this home pack under the skin of arms. Leave it for half an hour and then wash it with water. Walnuts and peanuts - Grind walnuts with peanuts and make powder. Mix a little lemon juice and honey in this powder and make a paste. Put this paste on the dark underarms and leave it for 10 to 15 minutes and wash it. Coconut Oil - Put a little amount of coconut oil under your underarms before bathing and wash it with soap.Vitamin E present in it enhances skin color. Cucumber - Take half cucumber, peel it and make thick paste. Now put it on both sides of underarms. If you do not want to put the pulp of cucumber there, then use cucumber juice.